With millions of chemical products available for use in laboratory and industrial settings,many companies may find themselves accumulating various products to serve differentfunctions. At a certain point; though, chemical products lose their effectiveness, are no longer needed to fulfill the role for which they were purchased or are just in the way. When this happens, safety managers may find themselves needing to dispose of dozens of different chemicals at once. Even when there is a small quantity of each product, they may each have different reactive properties, safety concerns and requirements for lawful disposal. 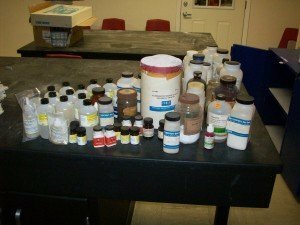 The process of identifying, sorting, packing and shipping numerous chemicals in situations like this is known as Lab Packing. Since it would be prohibitively expensive for businesses to place a single product into a waste shipping container, multiple products are often placed into a single drum or pail. Caution must be taken when packing these products; however. Dangerous reactions can occur if individual chemical containers break during shipment and incompatible products come into contact with each other. For this reason, only compatible products that won’t react should go into the same shipping container. When it’s known what particular chemicals can be packed together, they are place into polyethylene containers varying in size using a buffer such as vermiculite to cushion the individual containers and reduce the risk of containers breaking during transportation. If a spill or leak of a liquid chemical does occur, the vermiculite acts as an absorbent and should help prevent any leakage from the larger lab pack container. 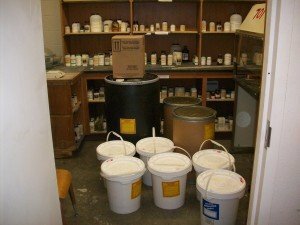 Educational institutions, commercial laboratories and healthcare facilities frequently utilize lab packing services but almost any type of business could be storing an assortment of chemicals that they need to dispose of. Common products that are lab packed include pesticides, degreasers, drain cleaners and medical supplies such as rubbing alcohol and hydrogen peroxide. The best practice is to try to use any product for its intended purpose but when it becomes necessary to dispose of chemical products due to space or safety concerns, trained personnel are needed to perform the lab packing. Protect Environmental offers lab packing and disposal among its other services. Whether you’re interested in clearing out a stockpile of old chemicals or need immediate response to a major chemical spill, our experienced staff are happy to provide solutions to your environmental issues.